The etymology of the word ‘martyr’ is derived from the Greek for witness, and to be a religious martyr is to bear witness to faith through torment and torture, to death if required. 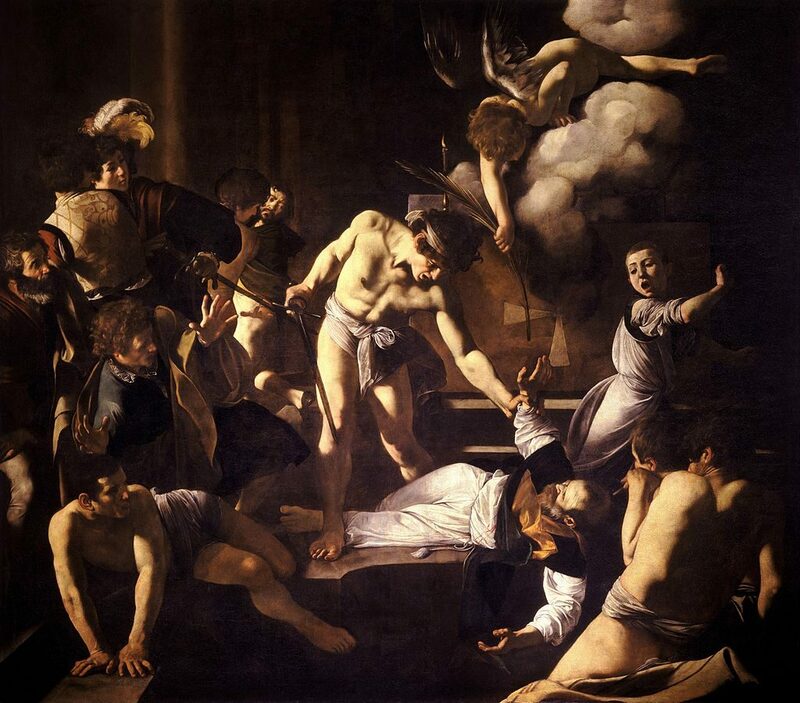 The Martyrdom of Saint Matthew (1599-1600) illustrates the final chapter of the subject’s life and is the last in a trio of canvases which make up the altarpiece of the Contarelli chapel in San Luigi dei Francesi in Rome. This was an important commission for the artist and had come about through Caravaggio’s staunch supporter and patron Cardinal del Monte. It is known that the French Cardinal Cointerel left detailed instructions for what the painting should depict before he died in 1585; ‘…in the form of a temple, with the altar raised up…where Saint Matthew dressed in vestments to celebrate the mass is killed by the hand of soldiers, and it might be more artistic to show the moment of being killed, where he is wounded and already fallen, or falling but not yet dead, while in the temple there are many men, women, young and old people, and children, mostly in different attitudes of prayer, and dressed according to their station and nobility… most of them terrified by the event, others appalled and still others filled with compassion.’ Rather uncharacteristically Caravaggio followed these directions almost verbatim. As is the case with the majority of Caravaggio’s works (and increasingly so through his career) the background is not used to fulfil any major descriptive role. Yet through the murkiness we can make out a pillar in the temple, a half obscured cross on the altar cloth and stone steps below it. Light comes in from the left-hand side of the canvas, and some streams in from the celestial opening from which the angel emerges. Only Matthew has his whole face illuminated, everyone else’s is in partial shadow, as if he is the only entirely pure one. If you have ever visited the church you will know that the chapel is a dark recess, which can only be lit by putting a coin in a box. But when it was installed, the constantly flickering light of candles on the altar would have diffused onto the painting and danced on the surface, picking out the light and throwing the dark areas into further shadow. By using brown/black to conceal and stark directional light to reveal (chiaroscuro) Caravaggio commands our eye and draws it to what he wants us to see. I think that the inclusion of a more detailed backdrop would distract from what is happening in the foreground. Movement, solidarity and depth is created by the clever placing of figures and application of tenebrism. Looking at the painting more structurally, the action is focussed on a triangular positioning of figures just right of the centre, starting with Matthew at the bottom, his killer in the middle and an angel above – his evangelical emblem. Both figures are reaching down to the saint, one has a sword in his right hand, the other the palm of martyrdom, one will follow the other. Through a simple yet powerful gesture the angel breaches the divide between the earthly and heavenly realms to pass the frond to the Matthew, an act only we and the saint can see. The angel is similar to that in the Inspiration of Saint Matthew, the central painting of the altar, with a head of thick brown curls and a muscular adolescent body. His pose is reminiscent of Michelangelo, twisting and balancing with yoga-like elegance. This contrasts starkly with Matthew, who has been imagined with flesh and blood, greying hair and a furrowed brow. His body is splayed out on the floor, forming a crucifix on its side. Traditionally, biblical figures were idealised, the external appearance being a reflection of the beautiful inner soul. His executioner on the other hand is the very essence of violence and hate. With a mask-like face and taught body he is resolute, determined to fulfil his mission. This group of three figures is the focal point of the painting, a kind of eye of the storm which everything else moves around and is being pulled towards, despite the majority of the figures efforts to pull away. This is the very moment upon which the story pivots. The tension created by the movement and stark lighting it is operatic. You can imagine an orchestra about to reach a crescendo, or a curtain about to fall upon the bloody conclusion as Matthew breathes his last and the killer’s strikes with his brandished sword. As a notorious brawler, Caravaggio’s vision must have been at least in part derived from what he had witnessed in street fights. The familiarity, honesty and imperfection of his characters are not devoid of dignity, quite the opposite. Through their realism they seem to say ‘this is the truth, this is what happened’. The characters around the central action respond in varied states of recoil and stages of departure, but none are able to tear their eyes away from the chaos. Going around the picture from the top left, the first face we encounter is that of Caravaggio himself. It was not unusual for artists to include themselves in religious paintings, but what is strange is the role he plays. Guiltily he runs away, but as he does so he looks over his shoulder with an expression which seems to say, ‘sorry, I can’t help’. Nevertheless, he is desperate to see the outcome of the event. Next, we see the back of a man’s head, as he contorts his neck and head to glance back, in a pose almost mirrors that of the artist. Two fancily-dressed men are fleeing too, one with a plumed hat can’t resist one last look as he turns his richly brocaded back to us. The other has his hand on the hilt of his sword, his face a veneer for morbid fascination. An old bearded man looks on with an expression of sincere concern, his eyebrows shoot up creating rows of furrows, his eyes wide with incredulity. In front of him a well-dressed young man appears more emotionally disturbed at what he is witnessing, with his hands outstretched he steps back conveying shock and an attempt to regain his balance. Three men in loincloths are positioned along the front of the painting in the bottom corners, almost separate to the scene. It is thought that they are converts waiting to be baptised by Matthew. To be baptised is to be reborn, to emerge from blessed water regenerated. There is a neat parallel in Matthew’s imminent rebirth in heaven. While the pagans will be submerged in the dark water below and rise in the light of God, Matthew goes to his apotheosis in the sky above. The altar boy on the right reacts with instinctive horror, and with his mouth in an audible scream he is the only onlooker to respond by raising the alarm. His youth and genuine revulsion to what is happening highlights the unexpected threat of death which has emerged from the shadows of this consecrated place. In a twisted yet meaningful turn of events, saintly blood will spill into the baptismal pool. With biblical subjects there is an assumption that the viewer knows the story, so it is the painter’s job to capture the emotive side which is going to resonate with them and inspire piety. Caravaggio delivers this basic function as well as allowing deeper reading into the painting, showing understanding of the scripture along with a complete comprehension of the humanity of the story. He plays with elements of the earthly and the divine through emotion and symbolism. People were wounded and murdered every day in Caravaggio’s Rome, and he insightfully utilises this cultural information to transform the mundane into the profound. By including figures dressed in contemporary fashions (the men on the left with their rich fabrics and feathered hats) he transports us to his world and uses the violence he was all too familiar with to his artistic advantage. With a retrospective view of creative development we can see how Caravaggio’s visions are a distinct move towards the Baroque, a focus on sensation and drama with which we are well acquainted. But contextually would have been a revelation to anyone who saw it. The three of paintings for this church were significant for Caravaggio, both as a successfully completed commission and as exposure for his reputation and style, which would prove to be enormously influential for the next generation of painters.